Poor education standards at madrassas in Pakistan came into sharp focus after 2001. Usually these religious school teach only rot memorization of the Quran and obedience. Musharraf had pledged to reform the sprawling madrassa system in Pakistan. But now it seems that the program is being discontinued. I guess like his other projects - he is considering it "mission accomplished" (see, Mush and Bush can easily be cross-referenced). 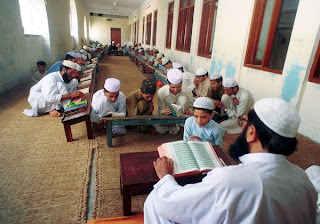 In 2002 the Pakistani government launched a five-year program called the Madrassa Reforms Project, a post-9/11 directive aimed at modernizing religious seminaries by broadening their curricula, establishing educational standards and reining in the militant ones. With suicide attacks on the rise in Pakistan, many fear that more madrassas will become breeding grounds for extremist ideologies. Yet, five years later, the program has been discontinued. Officials estimate there are about 13,000 madrassas across the country with fewer than 2 million students enrolled. But many observers say there are likely more than 20,000 madrassas. "None of these madrassas are registered or will bother to register," said Muhammad Ejaz Ahsan, who heads the Karachi office of the Human Rights Commission of Pakistan. "They are politically and financially independent and have no desire to be reined in by government authorities." Historically, madrassas were institutions of learning in the Islamic world. Today, a large percentage of the country's madrassas are community responses to sub-par government education. Why madrassa reform has failed isn't difficult to answer. Instead of being curtailed, madrassas sprouted up, providing free education, boarding and lodging for poor children, combating poor government schooling, unemployment, inflation and a host of other problems. 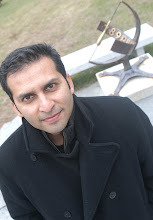 At an education conference one of Binoria's students, Adnan Kaka Khel, lectured Pakistan President Pervez Musharraf against his madrassa drive. "Mr. President ... (this) is class games, an unjust system, disrespect of talent ... limitless corruption, and the misuse of power – it is these dangerous trends which have driven the youth in this direction. You need to fix these problems, and then you will see if these youth are terrorists or lovers of peace." Pakistan's constitution obliges the state to provide free and compulsory secondary education. However, education (and health), key social-sector departments, have consistently been sacrificed in the name of "national interest" issues such as defence expenditure.